Tonight, the Alabama Phoenix Festival is hosting a special event to raise money for Children of Fallen Soldiers Relief Fund, Inc. You will also get a chance to learn what will be in the Alabama Phoenix Festival this year which takes place on Memorial Day weekend in Birmingham. 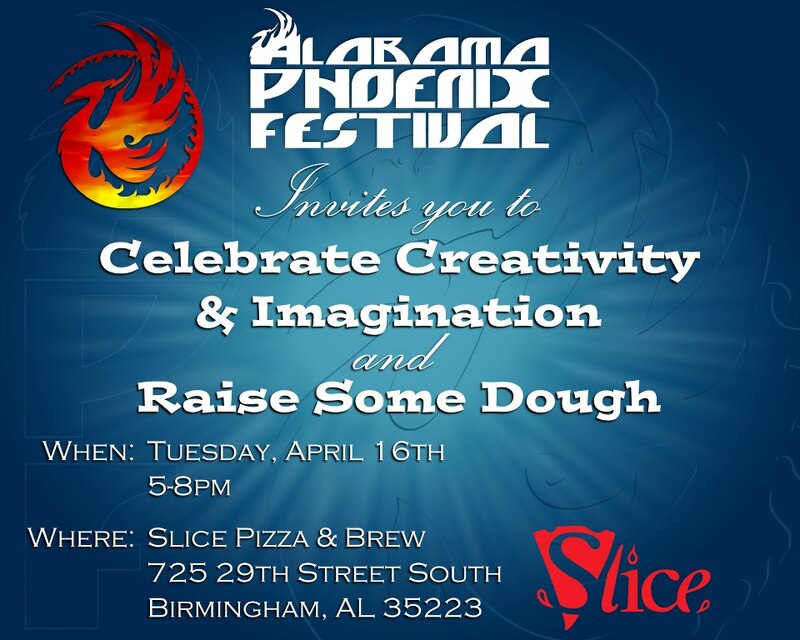 This event takes place at Slice Pizza & Brew in Birmingham on Tuesday April 16th. 10% of proceeds on Tuesday will be given to The Children of Fallen Soldiers Relief Fund on behalf of the Alabama Phoenix Festival. You will get to see some costumed characters and some LEGO creations. You will also get to learn all the cool guests and activities that will be at the Alabama Phoenix Festival this year! Best of all, you will be helping The Children of Fallen Soldiers Relief Fund, which provides financial and educational assistance to surviving U.S. Military children and spouses affected by the Iraq or Afghanistan wars. Also wanted to mention this, Birmingham Mountain Radio’s show Oh Brother Radio will be live at Iron City Bham every Thursday night from 7-9 pm. Every Thursday until Memorial Day Weekend, the radio team will choose the best dressed in costume to win a pair of passes to APF 2013! I guess I need to find out how I can get on their show. 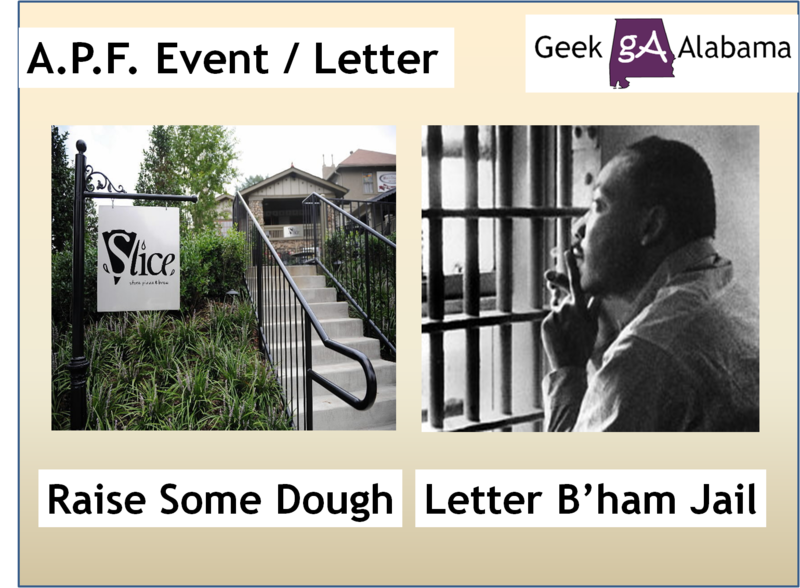 Today is a big day in the history of Birmingham, Alabama. 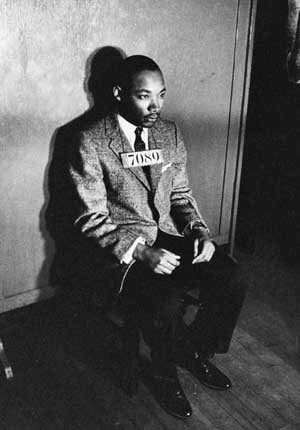 On April 16th, 1963, Martin Luther King, Jr. wrote the now famous Letter From The Birmingham Jail while he was behind bars. The letter defends the strategy of nonviolent resistance to racism, arguing that people have a moral responsibility to break unjust laws. Here’s a little history behind this letter. On April 10, 1963, Circuit Judge W. A. Jenkins issued a blanket injunction against “parading, demonstrating, boycotting, trespassing and picketing”. Leaders of the campaign announced they would disobey the ruling. On April 12, 1963, King was roughly arrested with Ralph Abernathy, Fred Shuttlesworth and other marchers—while thousands of African Americans dressed for Good Friday looked on. The letter was published in publications such as the New York Post Sunday Magazine, Liberation, The Christian Century, The New Leader, The Atlantic Monthly, and in King’s book “Why We Can’t Wait.” Alabama has made huge strides since the 1960’s in the terms of racism and segregation. This is a moment of history we can never forget! Watch this video with Dr. King’s voice reading some of his letter below.